Sundried Tomato Pesto Quiche - A recipe from Savor California, the online showcase for extraordinary gourmet foods and beverages from California. Put flour and salt into a mixing bowl.Add the butter. Using a pastry cutter, cut the butter into the flour. Fit it into a 9-inch pie plate (or a tart pan). Trim the crust so it overhangs the plate edge by about 1 inch all the way around, then tuck the edges under at the plate edge and crimp with your fingers or a fork. Prick the bottom of the crust all over with a fork at 1/2-inch intervals, then line the crust with foil or parchment paper. Fill with dry beans, uncooked rice, or pie weights, ensuring that the beans or weights are all the way up against the edges of the pan. Bake for 15 minutes. Remove the lining and weights. If the crust has puffed up in spots, gently press it back down with a fork. Bake, uncovered, for 10-15 additional minutes, until the bottom of the crust is lightly golden. Remove from oven and set aside. Reduce the oven temperature to 375 degrees F. Meanwhile, place the sundried tomatoes in a small bowl and cover with boiling water. Let sit 5 minutes to rehydrate, the drain and pat dry. In a large bowl whisk together the eggs, egg whites, milk, Greek yogurt, pesto, salt, and pepper. Then, stir in the spinach, Parmesan, and sundried tomatoes. With the pie plate still on the baking sheet, carefully pour the filling into the prebaked crust. 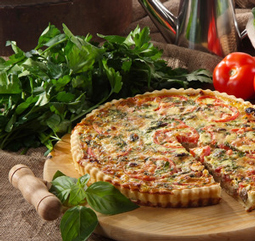 Decorate the quiche with slices of fresh tomato. Bake until the quiche is puffed and the center is set but still a little jiggly, 40 to 50 minutes. If the crust starts to brown too quickly as the quiche bakes, wrap the edges of the pan with foil to protect it. Let quiche cool on a wire rack for 15 minutes. Slice and serve warm or at room temperature.